You might guess from the rather straightforward title of this book is that it is probably not a page turner relating the ups and downs of a Presidential campaign that few people really care much about. And you may be right. But, if you’re the kind of person who thinks that the only reason for getting cable is to get C-SPAN so you can watch gavel to gavel coverage of political conventions, this is the book for you. Charles Thomson was a Brookings Institution member who wrote about politics and Frances Shattuck was a researcher there. However, that’s about all that I could find about them. The 1956 Presidential campaign was not full of drama. The most exciting part of the campaign may have been the selection of the running mate for Democratic challenger Adlai Stevenson. And even that wasn’t all that thrilling. President Dwight Eisenhower was a very popular incumbent President and the economy was doing well. The war in Korea was over, and, for the time being, things seemed peaceful. But, in 1955, Eisenhower suffered a heart attack. He recovered, but people were worried that he would not run for reelection. Or, if he did run, he would be certain to die in office. That led to people worrying that Vice President Richard Nixon would be taking over. And that was not something that most of America seemed ready for in 1956. However, Eisenhower recovered well from his heart attack (and a subsequent bout of ileitis) and announced that the would run for a second, and final, term, as the 22nd Amendment was now in effect and there would no more Franklin Roosevelts. For a while, a member of Eisenhower’s national security team, Harold Stassen, insisted that the Republicans would be better off dumping Nixon from the ticket and replacing him with a more palatable running mate in Massachusetts governor Christian Herter. While Eisenhower’s support of Nixon was always a little sketchy, the Republicans stayed with Nixon. The Democrats had three principal candidates: the 1952 loser Adlai Stevenson, Tennessee Senator Estes Kefauver, and New York Governor Averell Harriman. Stevenson and Kefauver faced off in primaries, while Harriman waited on the sidelines to see if he could pull off a late draft by the convention, whom he presumed wouldn’t want to nominate someone who had already lost. Kefauver had the advantage in the early primaries. He was well-organized and loved campaigning. Stevenson was not as willing to put in the time to work crowds and make speeches at first. Eventually, Stevenson realized that he wasn’t going to get nominated by just hoping that people thought he was a good candidate. The deciding contest turned out to be the California primary, then the second biggest state. The Democratic primary was a winner take all affair for the state’s 68 delegates. Stevenson and Kefauver campaigned hard in a state that had few Democrats in office. (Attorney General Pat Brown was the only statewide officeholder who was a Democrat.) Stevenson won in California to take a decisive lead. Kefauver dropped out of the race. At the Democratic Convention in Chicago, former President Harry Truman came out in favor of Harriman and tried to start a late push for the New York governor. However, Stevenson’s forces were able to fight back that late effort and won on the first ballot. In an attempt to draw more attention to the Convention, Stevenson decided to not express any favorite for a running mate and said he would accept whomever the convention chose. Kefauver, who still had a lot of support, wanted the job badly. So did Massachusetts Senator John F. Kennedy. Tennessee’s other Senator, Albert Gore, also wanted the job. Minnesota Senator Hubert Humphrey got to the convention hoping to be chosen as Vice President, but didn’t seem too eager to campaign for it. It took two ballots for Kefauver to win the nomination. Stevenson gave a speech talking about how he wanted to create a “New America.” Although he was not exactly big on specifics, but presumably it would be nicer than Eisenhower’s America. Most likely, it would have been remarkably similar, just a few tweaks of basic New Deal policies. The campaign itself had very little of interest going on. Eisenhower took it fairly easy and left most of the hard work of campaigning to Nixon. Stevenson and Kefauver traveled all over the country to try to get their message across, but not many people were buying it. (Or understanding it.) Also, Stevenson was prone to making gaffes about foreign policy. This didn’t help when a major international crisis sprung up in the time just before Election Day in the Middle East when British and French troops tried to take control of the Suez Canal from Egypt. The Republicans hoped that a big win from Eisenhower would allow them to reclaim control of Congress, which they held for just the first two years of Eisenhower’s term. But that was not to be. Eisenhower won big again, claiming 57% of the popular vote and 457 electoral votes to just 42% and 73 electoral votes for Stevenson. Eisenhower even managed to break into the Solid South winning Louisiana for the Republicans. However, the Democrats held on to their narrow 49-47 edge in the Senate and picked up two House seats for a 234-201 majority. Texas Senator Lyndon Johnson would go on to become a dominant figure in American politics at the time while serving as the Senate Majority Leader. The Republicans would not regain control of the Senate again until 1980 and would not win the House again until 1994. 1956 was an election year that was just a time for America to take a breather before they started into the wild elections of the 1960s. 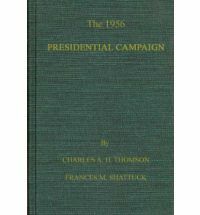 The 1956 Presidential Campaign is perhaps not the most fascinating Presidential election history book, but it was still somewhat fun to read. If not, at least it helped make me sense of the bumper sticker below.